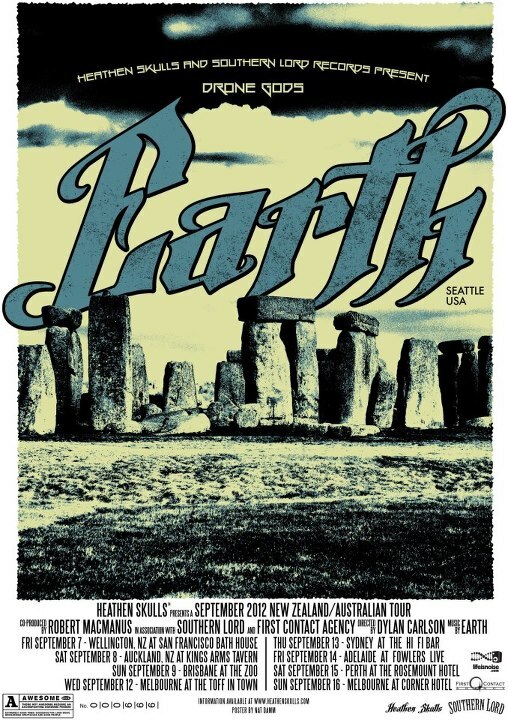 Heathen Skulls are proud to present Seattle drone doom outfit Earth in their very first performances on our shores this September. Earth formed in 1990 and led by guitarist Dylan Carlson. Mostly instrumental, their early work grew out of the Seattle area grunge scene and is recognized as pioneering the genre of drone doom — an experimental offshoot of doom metal, characterised by droning, minimalist, lengthy and repetitive structures. Their early albums could be seen as a variation of the experimental doom-influenced metal of The Melvins. They now feature a markedly different sound, slow-paced and lengthy featuring strong elements of country music and jazz and the addition of a drummer. Released earlier this year, “Angels Of Darkness, Demons Of Light II” is ultimately a completely unanticipated direction for Earth, and a very welcome one at that. Well respected by their musical peers, Earth were invited by Portishead to be apart of their curated ATP festival in 2011 and were subsequently asked to perform at ATP 2012, curated by Jeff Mangum (Neutral Milk Hotel). Earth are heartfelt, haunting and deliver slow moving music that stretches into other worlds. Don’t miss your chance to see them in their first Australian tour this September. Special guests to be announced.